Andy Pettitte used PEDs. Why isn't he a target for writerly abuse? Joe Posnanski wrote (another) brilliant little post, this time on Andy Pettitte, and whether he's the greatest Yankee starter of all time. The answer, of course, is no, but Pos twists the topic to note that the Yankees, despite their multiple championships, their incredible franchise winning percentage, etc & co, don't really have a great starter in their franchise history. Sure there's Whitey Ford and Red Ruffing...and Pettitte...but there are no Walter Johnsons, Bob Gibsons, or Tom Seavers. 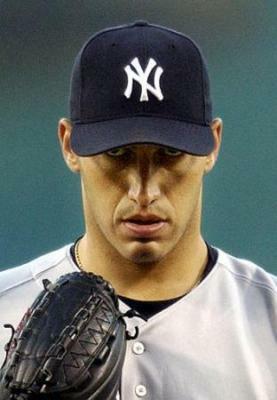 ...I must admit, I am baffled by the persistence of the Andy Pettitte love out there. It runs so counter to the stringent anti-drug stance that has choked and suffocated so many of the good feelings people have toward players of the Steroid Era. Roger Clemens gets 37.6% of the Hall of Fame vote, and few seem to care. Barry Bonds gets even less, and people seem happy about it. Players like Mike Piazza and Jeff Bagwell and even Craig Biggio find their legacy weighed down by whispers and innuendo. Heck, Chris Davis goes on a hitting tear, and doubt rings around him. Meanwhile, Andy Pettitte -- who admitted (not exactly voluntarily) being a PED user -- has hosannas thrown at him like rice at a wedding. It's just kind of baffling. It's almost as if all the vitriol against PED-suspect Hall of Fame candidates is personal, and that PEDs are a convenient excuse for writers to injure people that treated them poorly for so many years. Barry Bonds, for one, was notoriously difficult to deal with. He's famous for having his own television and barcalounger in the San Francisco Giants' clubhouse ("creating his own livingroom"), and for requiring reporters to stand a respectful distance away while he ignored them. Or Roger Clemens, an egotistical jerk who gave his kids names that started with "K" to celebrate his professional achievements. A guy who introduces himself as "the Rocket." A guy who oozes insincerity, and who often bullied the reporters who had to ask him questions after games. You probably already know where I stand on PEDs and the Hall of Fame. I think it shouldn't be an issue for induction. That's because we don't know who used, for how long, and how it affected their games. Hall voting should be about how a player did during his career, not whether they were a nice guy or not. Frankly, a "nice guy" Hall of Fame would not be all that interesting. Speaking of Joe Posnanski, he also wrote a fantastic homage to Jeff Francoeur and Royals GM, Dayton Moore's inevitable obsession with the player. Pos has been writing a load of posts about the Royals this season, kicked off by the team's loss of home run power and its May-June nosedive (they've since recovered). And the posts reminded me how many good and interesting writers have come from the ranks of Kansas City fandom or reporting. Here's a quick list: Bill James, Rany Jazayerli, Jeff Passan, Sam Mellinger, and Rob Neyer. And, of course, Joe Posnanski. Can any other team boast of such a list of influential and interesting writers? Here in Erie, the Harrisburg Senators are back in town for a four-game set starting Thursday. They're the Washington Nationals' AA affiliate, and last week I told you to keep an eye on center fielder, Brian Goodwin, the organization's third-ranked prospect, according to Baseball America's preseason rankings. During last week's series, Goodwin went 3-for-11 with a home run, double, and a walk while leading off for the Senators. I also claimed that the Senators' fifth-ranked prospect (according to BA) – Nate Karns – wasn't going to pitch, but of course he started the third game of the 'Wolves-Senators tilt and threw five innings of one-hit ball in Harrisburg's rain-shortened 5-0 shutout over Erie. Erie won the first two games of the set, thanks to tremendous pitching performances by Seawolves Drew VerHagen and Jon Link. VerHagen is a 22-year-old righty drafted in the fourth round out of Vanderbilt who was recently called up to Erie. Last year, Baseball America ranked him as the Tigers' 14th-best prospect. You can find a January scouting report on VerHagen on SB Nation's Bless You Boys. Jon Link came to the Tigers in a much more roundabout manner. He bounced around the minors with a number of different organizations – the Padres, White Sox, Dodgers, Orioles, and Marlins – ending up with the Independent Association's Wichita Wingnuts earlier this year. Last week against Harrisburg, Link threw a five-hit complete game win for the 'Wolves. It's a good story – you can see Reisenweber's take here – a 29-year-old taking another shot at reaching the big leagues. (He pitched nine games in relief for the Dodgers in 2010.) The interesting thing about Link this time around is that he's starting games. During his nine-year career, he was primarily a reliever, starting only 19 games – and 10 of them this year. That's the opposite career trajectory pitchers usually take; prospects usually begin their careers as starters, and end up in the 'pen if they fail to develop secondary pitches, or if their stuff plays up only in short bursts. In any case, he's clearly a guy we should be rooting for.